Configure the next generation of DC motors. Customise and combine DC motor (DCX), gearhead (GPX), and encoders (ENX) to match your individual requirements: fast, easy, and online. After only 11 working days, the drive systems are ready to be shipped from Switzerland. Detailed product data can be viewed online immediately and 3D data for the configuration is available to download using the maxon on-line configurator. The DCX 22 and GPX 22 pictured above. When space is limited but high torques and dynamics are required, the maxon EC-i 40 motor is the right choice for you. There are currently four types in this series ranging from Ã˜40mm, 50 – 100 W. Click here for specific information on the performance of this motor. There’s not much more to say…..this motor speaks for itself. Pictured above is the brushless EC-i 40, 100 W motor. maxon flat motors are well-suited for use when space is at a premium. They offer an attractive combination of high performance and a low price. 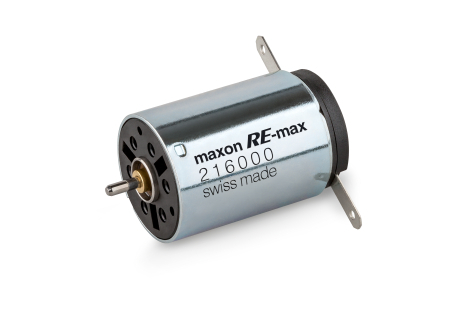 The brushless flat motors by maxon motor are designed as internal and external rotors and can reach speeds of up to 20,000 rpm. The simple design made it possible to largely automate the manufacturing of the motors – and this is reflected in the economical price. Choose from EC flat motors with hall sensors, sensorless motors, or EC motors with integrated electronics. These motors can also be combined with gearheads and encoders. To find out more about these motors please call + 61 2 9457 7477 or visit the maxon motor Australia website. The EC45 flat 50W motor. The upper class of brushless DC motors. The high-power 4-pole motors provide maximum performance per unit of volume and weight, and make the buying decision easy with an unsurpassed service life. Ø 30 mm, 200 W. That is top performance. Thanks to the special winding technology and the 4-pole magnets, the maxon EC-4pole drives are unbeatable when it comes to delivering the highest driving power per unit of volume and weight. The motors have no cogging torque, high efficiency, and excellent control dynamics. The metal housing ensures good heat dissipation and mechanical stability. When it comes to service life, these motors also leave the competition far behind. For more information please visit our website or call + 61 2 9457 7477 to speak to a sales engineer. Above is the selection of EC 4-pole brushless motors from maxon motor. Custom Configuration: more options with maxon motor. From mid-April 2015, our drive portfolio will be bigger. maxon motor is releasing a multitude of new products. Customers will have an even greater selection of online configurable DC motors and gearheads. Plus a new brushless DC motor will be available that is just 4 millimetres in size. Swiss drive specialist maxon motor is releasing a range of innovations, among them new DC motors and gearheads for the successful X-drive series. These high efficiency drives are configurable online and are ready for delivery in as little as 11 days. 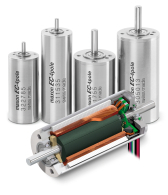 Size-wise, one new motor stands out in particular: The EC4 is a brushless DC motor with a diameter of only 4 millimetres that is especially suited for applications in medical technology. It can be combined with a matching gearhead. For customers who need higher torques, maxon will be launching the brushless EC-i40 High Torque micromotor with several power ranges. New product catalog – all you need to know. For further information please speak to one of our sales engineers on +61 2 9457 7477 . The new maxon motor catalogue cover for 2015/16. maxon EC-max is the economical EC line. Thanks to the brushless design, the drives are well-suited for long periods of operation. The maxon EC-max drive is a further development of the principle behind the A-max and RE-max programs. The automated manufacturing ensures that the costs are kept low. 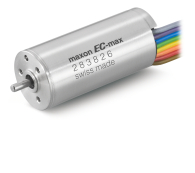 Yet you can still tailor the products to your own needs: maxon EC-max stands for an optimal price/performance ratio, with all of the advantages offered by a brushless DC motor. For more information please visit our website or speak to a sales engineer on +61 2 9457 7477.
maxon EC motors are characterized by split-second acceleration and an unrivaled life span. 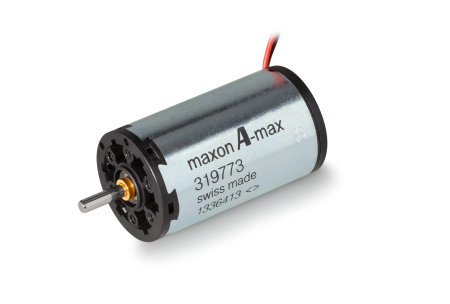 The electrically commutated maxon EC motors are longer-lasting than their counterparts in the DC range. The long life span offered by the brushless design can be exploited particularly well using preloaded ball bearings. The EC motors have excellent torque characteristics, high power, and a wide speed range of up to 100,000 rpm. The outstanding controllability of the motors enables high-precision positioning tasks. The DC motor for getting started – brushed A-max. The drives use an ironless rotor and AINiCo magnets. Thanks to automated manufacturing, the maxon A-max motors offer top performance at an attractive price. Of course you don’t need to forfeit maxon’s modular system. A large variety of gears, sensors and controllers is available and can be combined to your heart’s content. For more information visit the maxon motor website or call a sales engineer on + 61 2 9457 7477. Pictured above is the maxon DC brushed A-max motor. High power rare earth DC motors with competitive pricing. maxon RE-max is the economical RE-line. Thanks to neodymium magnets, the drives are very powerful. High-performance neodymium magnets (rare earth) supply the required power. The automated manufacturing ensures that the costs are kept low. Yet you can still tailor the products to your own needs: maxon RE-max provides great value for the price. For more information please visit our website or speak to one of our sales engineers in the Sydney office on + 61 2 9457 7477. Pictured above the brushed DC RE-max motor.